Navigate to individual resource folders using the folder dropdown. Check the boxes next to existing resources that you want to Move and/or Delete, then open the vertical menu in the toolbar to complete the task. Open the toolbar in the menu to create a New folder or Delete folder. Click the resource to open it. Open Resources from the Domain tool. Select the folder into which you want to put the files, or create a new folder for them by clicking the plus icon. Click the Upload [plus sign] button in the toolbar. 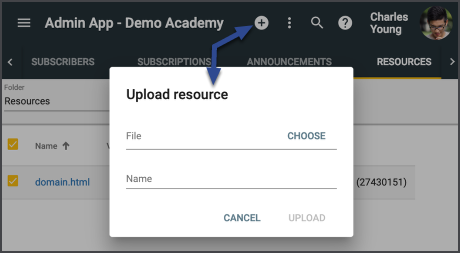 Click Choose, give it a Name, and select Upload for each file you want added to resources.